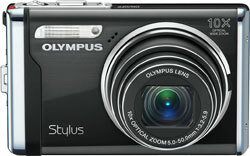 Lets Go Digital has reviewed the Olympus Mju 9000 (also known as Stylus-9000) compact digital camera. This Olympus camera feature 12 megapixels and 10x optical zoom. Lets Go Digital ends up giving the Mju 9000 a “Good” 72 rating. It gets an average score because there are many similar cameras on the marked and the Mju 9000 scores moderately compared to them. There is visible noise from ISO 200 and there is some lens blur. On the positive side the camera scores high on design. Read the full review of the Olympus Mju 9000 camera here.